A GEC from the panel terminates to the water pipe, then a bonding jumper from the water pipe terminates on the ground rod. One of my colleague says it is a violation because it has to be one continuous piece from the panel to the water pipe then to the ground rod. I say the only portion that has to be continuous is the GEC not the bonding jumper that is to the ground rod. i will try to post the picture. Last edited by Niko; 04/06/11 12:37 AM. The GEC need only be continuous between the panel and the first grounding electrode. Code language can lead you to your friends' view, but the matter is addressed in Soares. Call it another example of bad grammar on the part of the NEC. Another section of "Bad Grammar" in the NEC IMHO is under 680 for "Bonding". Where the bonding conductor must be "Continuous without splice", but you can land 2 pieces of bonding wire under a proper bonding lug strip. 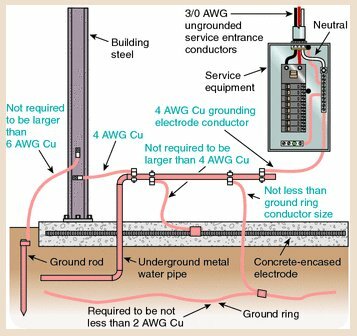 Like in a deck box, you have the #8 from the light into a bonding lug, and on another bonding lug you have the #16 ground wire from the light and the #12 grounding wire from the circuit that feeds the light. A lot of the lugs that I see for conduits and pipes are designed so that you can lay the conductor in the lug and tighten it without having to cut the wire. I have seen those kinds of bonding bushings too. They are fine and acceptable. I was referring in my post about using approved lugs to connect "Bond" wires to and yet it doesn't mean "Without Splice". Some EC's go to great extent to run wires without splice but fail to use these lugs that are approved for use. My only problem with landing on the rod first is what size wire is that? it is #4 to the water pipe first then a separate piece of #4 goes to the ground rod. Last edited by Niko; 04/07/11 02:51 AM. That is exactly right the way you described it in the OP. The GEC is the first connection to an electrode. everything is a bonding jumper. Thank you Greg, That is exactly what the installation is. i have that picture in my hand book i have been trying to post a picture of the installation. Please note that you must enter some text in both the "subject" and "post" fields when responding otherwise you will receive an error; you cannot just respond with an attachment . I put the photos I post on my web page and link them with the UBB "img" command.